It’s our 11th bake for The Home Bakers! Started by Joyce from Kitchen Flavours, The Home Bakers are a group of home bakers who aimed to complete baking all recipes in a chosen cookbook. 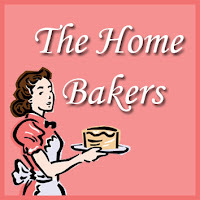 If you’d like to join us, do find out more about us here: About the Home Bakers. We are currently baking from Coffee Cakes by Lou Seibert Pappas, which is a pretty wonderful cookbook – some of my tried-and-tested favourites were the Chocolate Swirl Bread, Mocha-Cappuccino Cake and Blueberry Streusel Cake. So soft, so moist, so fluffy! How can one not like a muffin that’s so soft, so moist and so fluffy? (Sorry, on repeat mode here.) 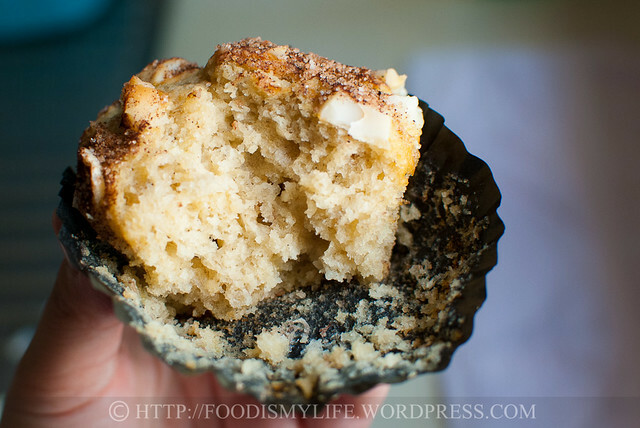 The texture of this muffin is truly amazing, every bite of the muffin makes me yearn for more. On a side note, instead of calling this a cake, I decided to call it a muffin as it is more muffin-like – uses oil instead of butter, no need for a mixer etc… and I think it’s the perfect treat for breakfast! Another amazing thing about this muffin is the flavours combination. I’ve always heard the combination of cinnamon + apple, but cinnamon + bananas? It’s definitely the first for me and I’m surprised the flavours complemented each other so well. 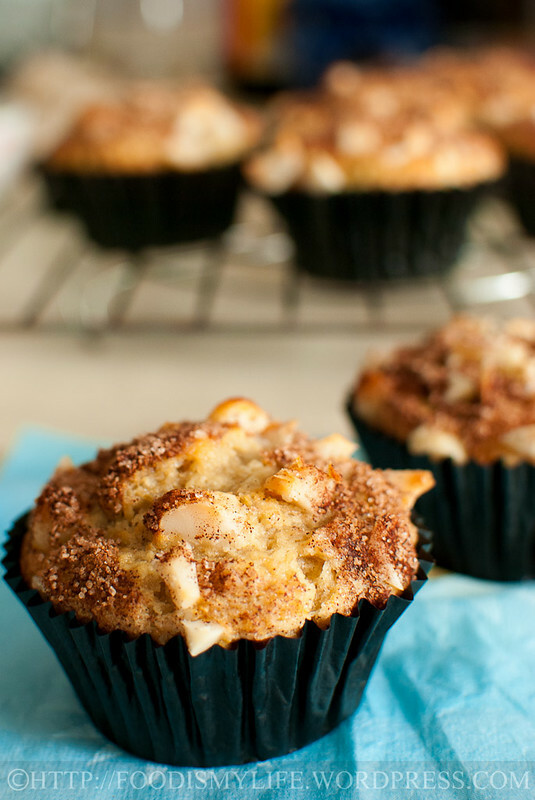 Overall it’s a winner combination (in terms of taste and texture) for me and I’ve already made it again for a friend who loves bananas and fell head over heels in love with these muffins when I gave her some to try. 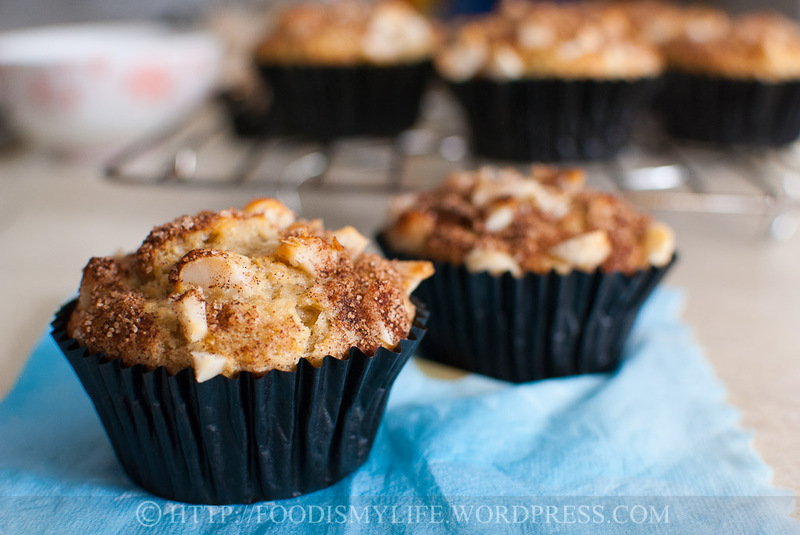 So please do give these muffins a try, and let me know if you love it as much as I do! 🙂 On to the step-by-step photos! 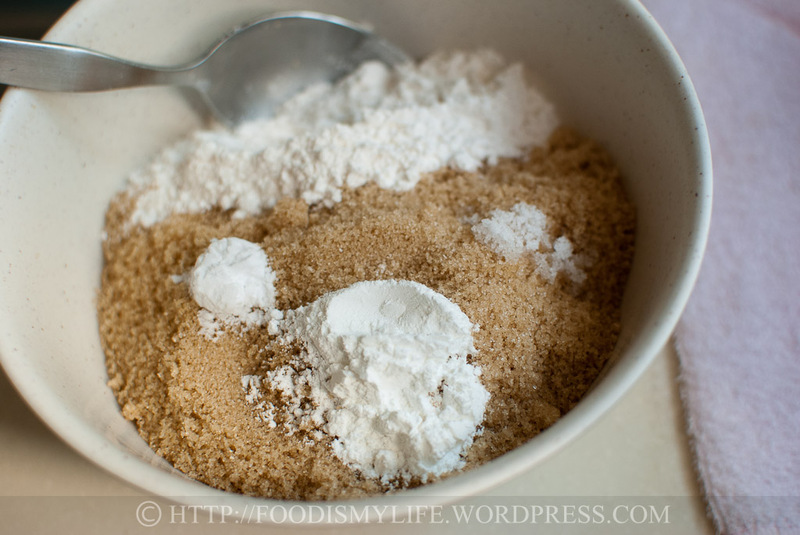 Combine plain flour, brown sugar, baking powder, baking soda and salt in a small bowl. 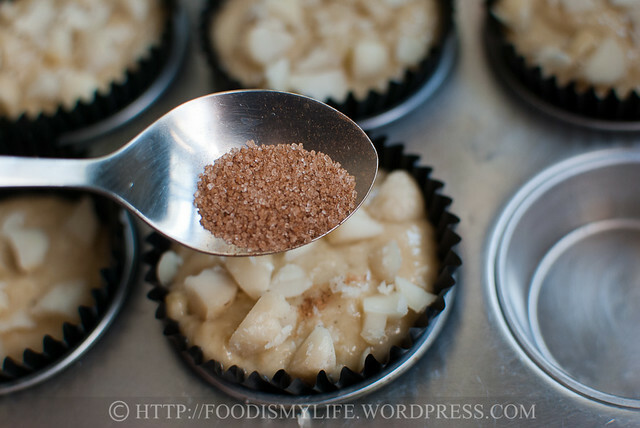 I love, love, love brown sugar, they make the baked goods so caramelize-y good! 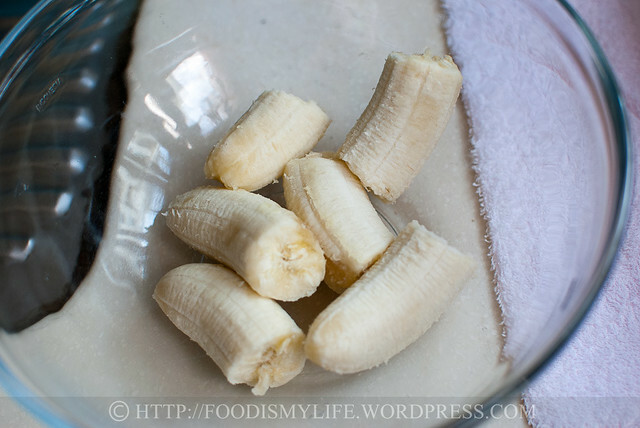 Mash the soft bananas with a wooden spoon – easy peasy! 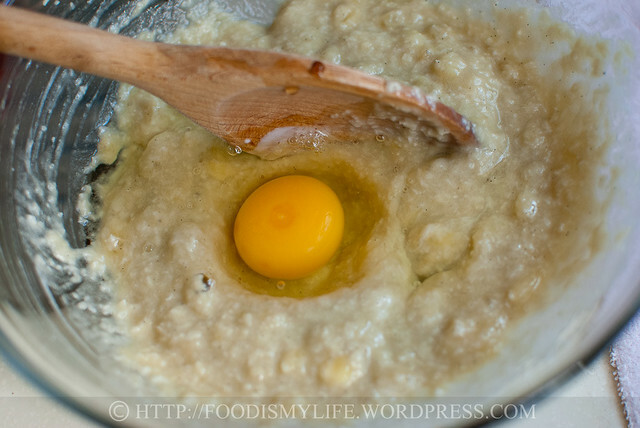 I love how no creaming of butter is needed for this recipe! The taste of the rum is very subtle, so you can use more if you like the muffin to have a stronger rum taste / smell. Mix well with the wooden spoon and add in some flaked coconut. The recipe simply stated “sweetened flaked coconut” and I was wondering whether the author meant the freshly grated ones or the dried ones. In the end I decided to use dried coconut as it’s easier to obtain and I can keep the leftovers easily without worrying about spoilage. As the amount used is very little, I’m not sure how it affects the taste / structure of the muffin. However, I can taste a little chewiness in the muffin, which I think was due to the coconut. Mix well and add in sour cream / yogurt. Sour cream is not cheap to obtain here in Singapore, so I decided to use a cheaper but equally effective alternative – full-fat plain yogurt. It’s cheaper than getting sour cream or crème fraîche. 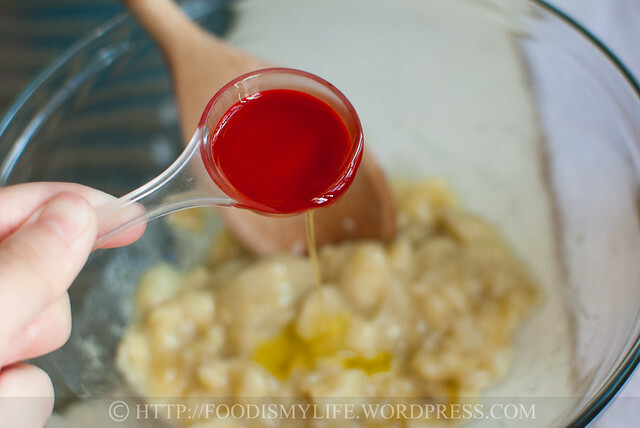 Mix well and add in some vanilla extract / paste. Beat in the egg with the wooden spoon. 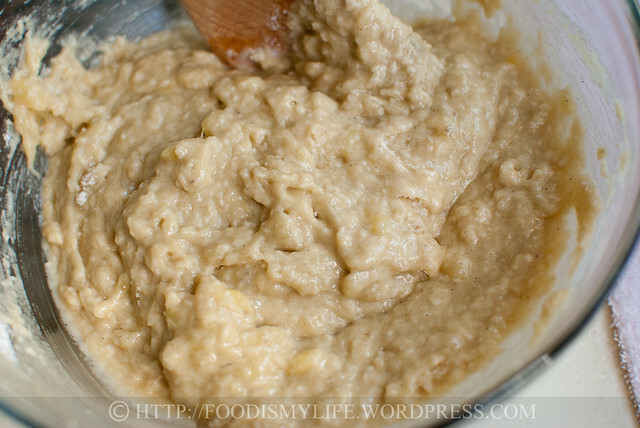 Add in the flour mixture little by little and stir the mixture into the batter gently. 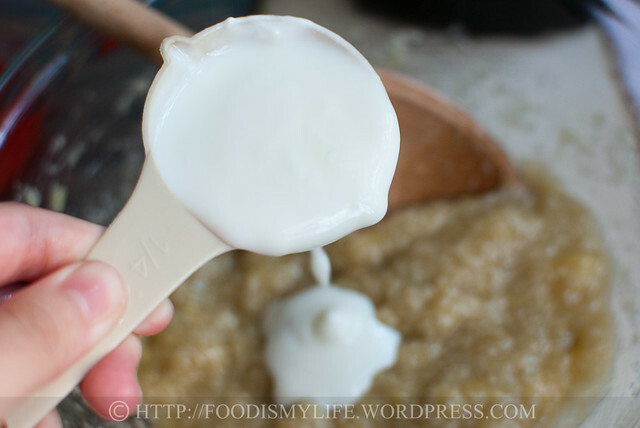 The batter will look something like this – not overly thick! Scoop the batter into muffin tins – an 1/4-cup ice cream scoop works best here. 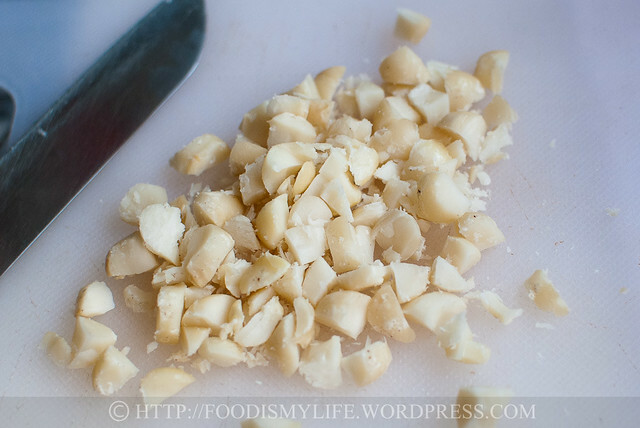 Chop up some macadamia nuts. I think walnuts will work perfectly well here as well, but I think the amount of walnuts used can be reduced slightly as it has a stronger taste than macadamia nuts. Sprinkle the chopped nuts over the muffins. 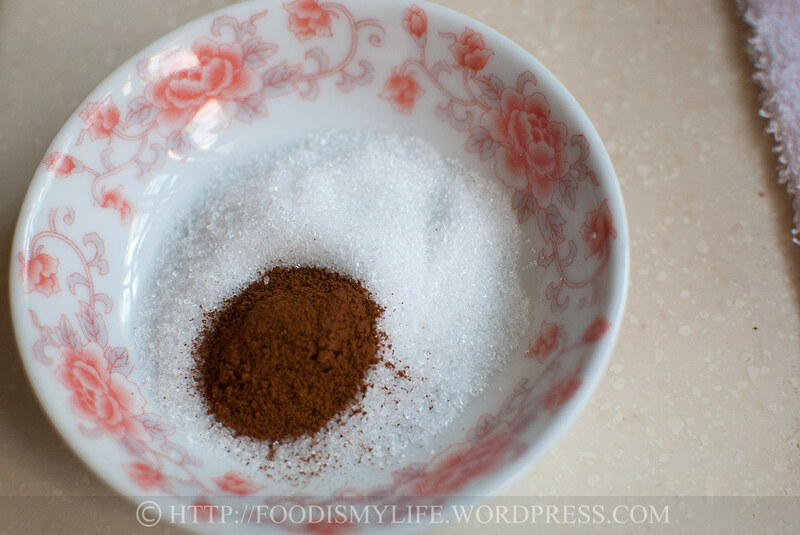 Combine some sugar and cinnamon in a small dish. 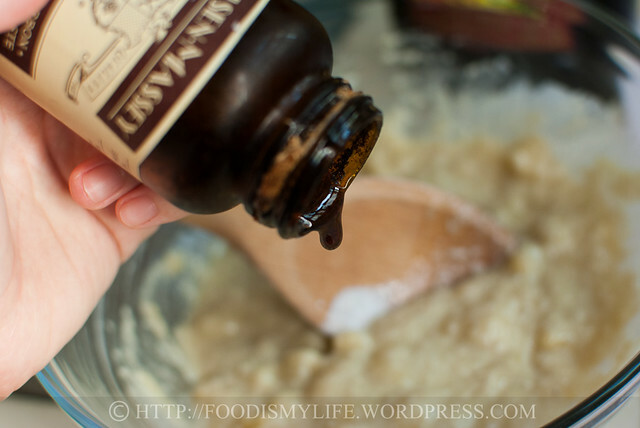 Sprinkle the mixture onto the muffins and bake away! Or if you’re eager as me, dig in while it’s still warm! Yum! 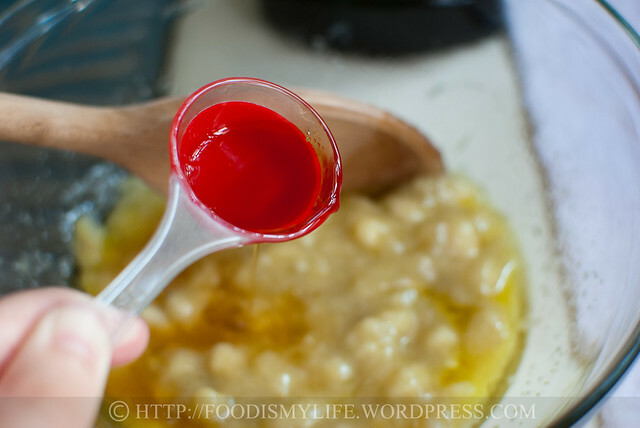 Do head over to Kit’s blog for the original recipe (a shout out of thanks to you, Kit, for choosing such an awesome recipe!) 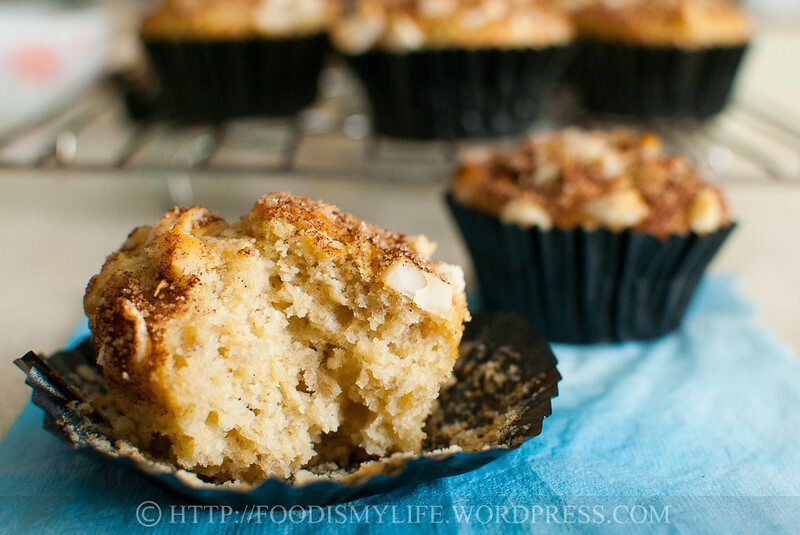 If you want to use a blender / food processor to make these muffins, do head over there! As I’ve modified the recipe, I’ve also attached my version below as well. Please head over to other Home Bakers’ Bakes here: Banana, Macadamia Nut and Coconut Coffee Cake. I’m also submitting this recipe to Recipe Box #21 hosted by Bizzy Bakes! Baking Note: This seemed like a really long list of ingredients but don’t worry it’s really easy to put this cake together! Starting with all ingredients at room temperature, it only takes 5 minutes to measure them and another 5 minutes to mix them together – and then they’re ready to be baked! You’ll get some absolutely soft, fluffy, moist and delicious muffins, so do give these muffins a try! Preheat the oven to 175 degrees Celsius. Line 9 muffin tins with muffin cups. 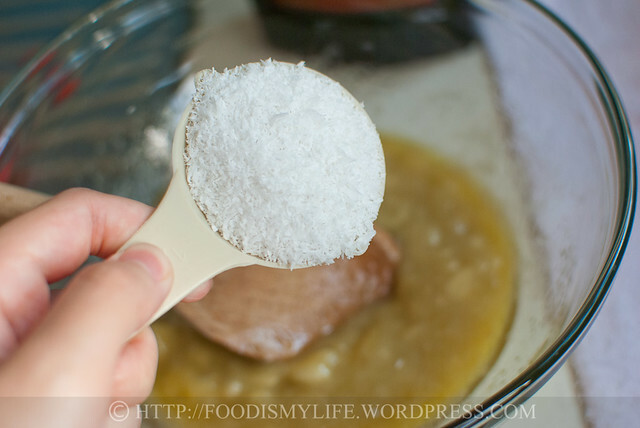 Combine the flour, baking powder, baking soda, salt and brown sugar in a small bowl. 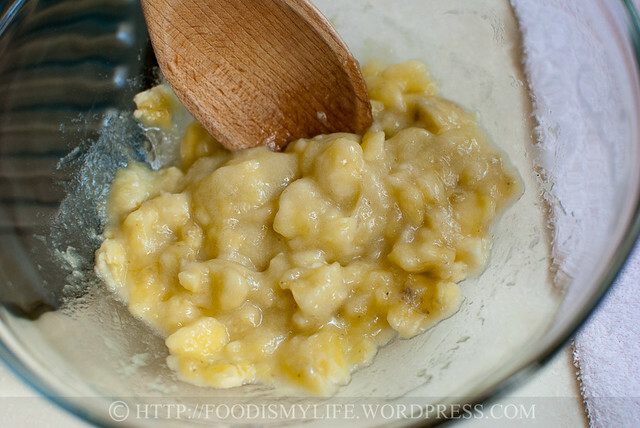 Combine the mashed bananas, oil, rum, coconut, yogurt, vanilla and egg in a large mixing bowl with a large wooden spoon, mixing well after each addition of ingredient. 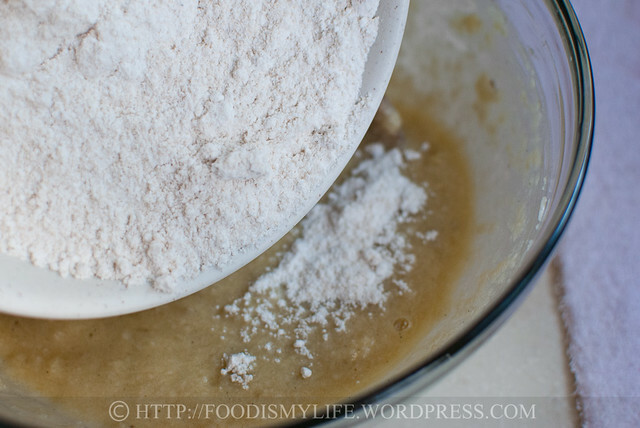 Stir in the flour mixture. 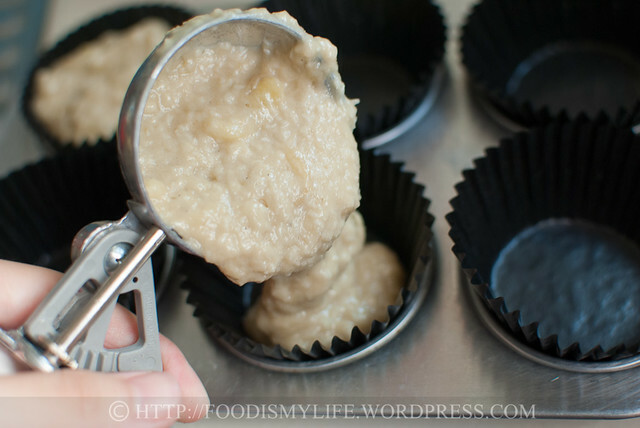 Scoop 1/4-cup full of batter into the muffin. Sprinkle with nuts, caster sugar and cinnamon. Bake the muffins for 18 – 20 minutes in the preheated oven until a skewer inserted into the center of the muffin comes out clean. Cool the muffins on a wire rack. Serve them warm or at room temperature. Store the muffins in a container in the refrigerator for up to 3 days. Reheat them at 100 degrees Celsius for 5 – 10 minutes. Who else loves everything in these muffins? I’m totally loving it! I love your “new home” It is so cute and well designed! And those cupcakes look amazing! Congrats!!!!! Thank you for the compliments Grace 🙂 Do give the muffins a try, they’re absolutely yummy! Hi Zoe! Welcome back! Hope you had lots of fun in Singapore 🙂 Hope to see you in the next bake! Oh lord, these look fantastic! I LOVE macadamia nuts and coconut. Is it wrong to eat an entire batch by oneself? Yes, Lena, it’s an amazingly delicious combination of flavours! I’m getting hungry just thinking of them. You are right, its a quck bread/muffin rather than a coffee ckae. Nevertheless, this one is a keeper. Love the tons of flavours packed in it. Lovely results and fab pictures! certainly agree with you that it is soft and moist, i like it too! so are the toppings, delicious! Hi Kit! Thank you so much for choosing this recipe, I really, really love it! Haha and I agree the muffins are absolutely addictive, despite the seemingly-odd combination. 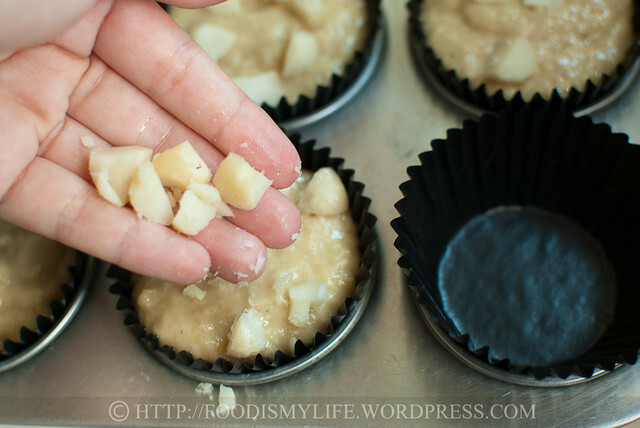 I had lots of fun baking these muffins, let’s bake more for the upcoming THB! Have a great week ahead! Thank you Valynn! I’m quite surprised this combination worked so well! Bananas and macadamia nuts sound divine together! These muffins look delicious! Banana, Coconut, Macadamia… Love the combi! Very nice muffin recipe. 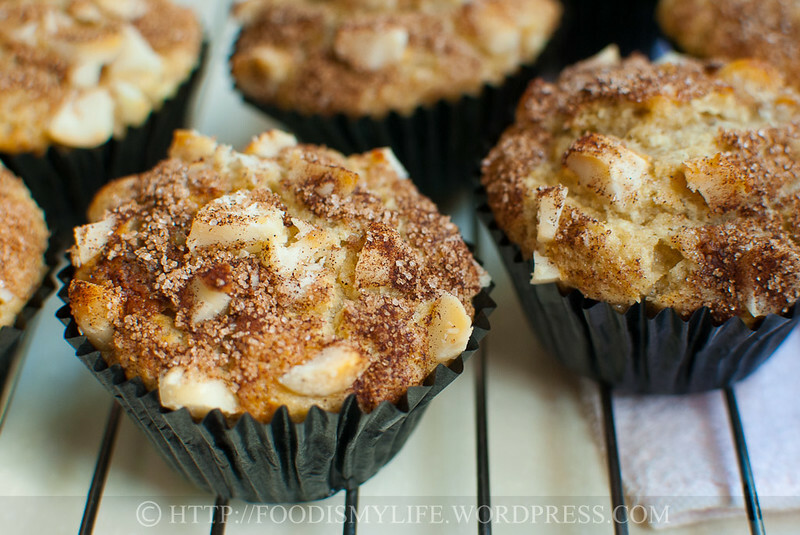 Love macadamia nuts, a little expensive but they sure look great in this muffin. Thanks for sharing, look forward to trying. This is one lovely bake! A winner definitely in terms of texture and taste! Thumbs up from my family! I made this in the morning, then I was out the whole day and when I came back after dinner, there was only 1 small slice left! Even then, my son “booked” that slice for his breakfast! haha! Have a great delicious Sunday! Looks delicious as a cupcake!